If you’re unfamiliar with chilli mac, it’s basically a cross between chilli and macaroni cheese (hence the name!). Start by making a really simple chilli, with peppers, onions, kidney beans and lots of spice. Then add the pasta. It cooks right there in the chilli – there’s no need to pre-boil. It soaks up a load of flavour from the chilli, and the starch helps to make the spicy sauce nice and thick. If it was possible to fall in love with a plate of food, I think this is the plate that would do it for me. To make this one pot recipe even easier (if that was even possible), I used almost entirely ingredients from the store cupboard and freezer. No extra grocery shopping + only one pot to wash up = seriously could this get any easier?! I started with some frozen onions and peppers from Iceland (the shop, not the country!). I must admit, I don’t often use frozen vegetables, but it’s so much easier than having to faff about peeling and chopping, which is always the worst part of preparing a meal in my opinion (especially garlic – who made the most delicious vegetable the most awkward?!). When you’re tired and you just want your dinner to make itself, using pre-chopped frozen veggies is about as close as you can get. Frozen veggies aren’t any less nutritious than fresh veggies, as some people may think. The act of freezing seals in the goodness and doesn’t require any artificial preservatives. I don’t really know why I haven’t used frozen veggies very often in the past – I’ll definitely be using them more often in the future, no shame! Come to think of it, I did actually make a lasagne using frozen veggies the other day and it was so much quicker than chopping up loads of fresh veg and then having to pre-cook them. I used a bag of Mediterranean-style veg and just threw them into the dish frozen. The most stress-free lasagne I’ve ever made! Anyway, this post isn’t about lasagne. Sorry, I get a bit carried away when it comes to pasta. When I was in Iceland picking up the veggies, I was pretty surprised to see a whole section of the shop devoted to frozen soup. Frozen soup! I never even knew that was a thing. I was pretty impressed by the ingredients list of Iceland’s frozen tomato and basil soup (passata, water, extra virgin olive oil, basil, salt, garlic puree… and that’s it! ), so I decided to use it as a sauce in this chilli mac. 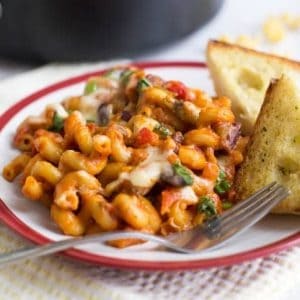 I’d usually use a plain old passata, but since the soup already had some extra flavour to it, it was an easy way to make my chilli mac extra tasty. When you first add the soup and the dried pasta to your veggies, it won’t look that appetising… but once the pasta has absorbed the spicy sauce, it becomes thick and delicious. A bit of grated cheddar is all you need to finish it off to perfection! Feel free to adapt the recipe however you see fit. As I said, I used mostly store cupboard and freezer ingredients, but I did throw in a few fresh mushrooms too, just because I had some in the fridge that needed using up. Chilli is always good for clearing the fridge! 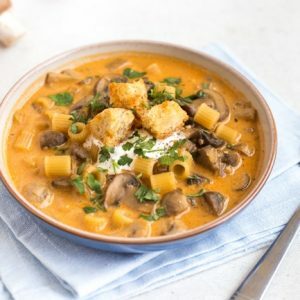 I definitely wouldn’t go out and buy fresh mushrooms especially, otherwise that kind of defeats the point of it being an easy store cupboard recipe – but you can use whatever else you have in the fridge instead if no mushrooms! Do you use frozen vegetables very often? Check out the hashtag #PowerofFrozen and the Power of Frozen website to find out more about frozen food. If using Iceland’s frozen tomato soup, put it in the microwave for around 10 minutes to defrost. Meanwhile, heat the oil in a large saucepan. Add the onions, peppers, finely chopped chilli, and diced mushrooms. 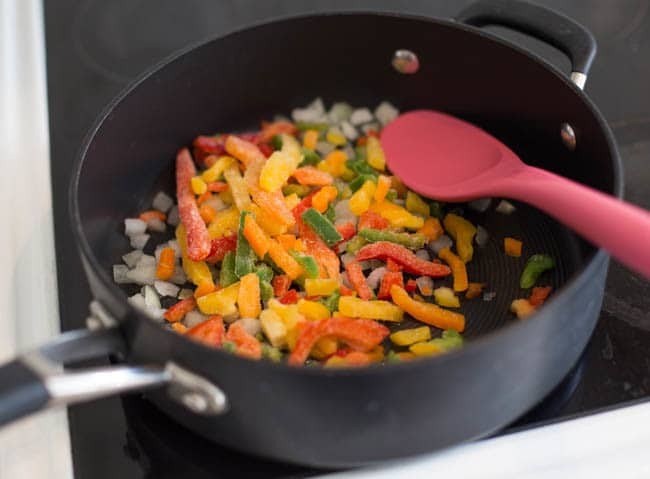 Cook over a medium heat for a few minutes, until the vegetables are fairly soft. Add the kidney beans and spices, and season well. Next add the tomato soup, water, and raw pasta. Mix well, and bring to a simmer. Cook over a medium-low heat for around 15 minutes, stirring regularly, until the pasta is cooked. Add another dash of water if you need to. When the pasta is ready, add about half of the grated cheese, and mix to combine. Sprinkle the remaining cheese on top, and cook over a low heat until the cheese melts (place it under a grill / broiler if you prefer). Serve hot, preferably with fresh coriander (cilantro) and chopped spring onions. « Previous PostAmuse Your Bouche in the USA! 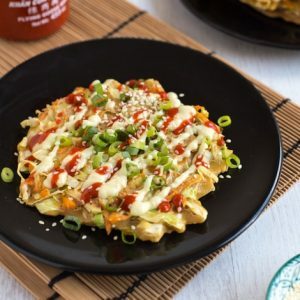 I make this recipe with chickpea pasta for less carbs and added protein. Just add the pasta a couple minutes later and a splash of liquid if it needs. 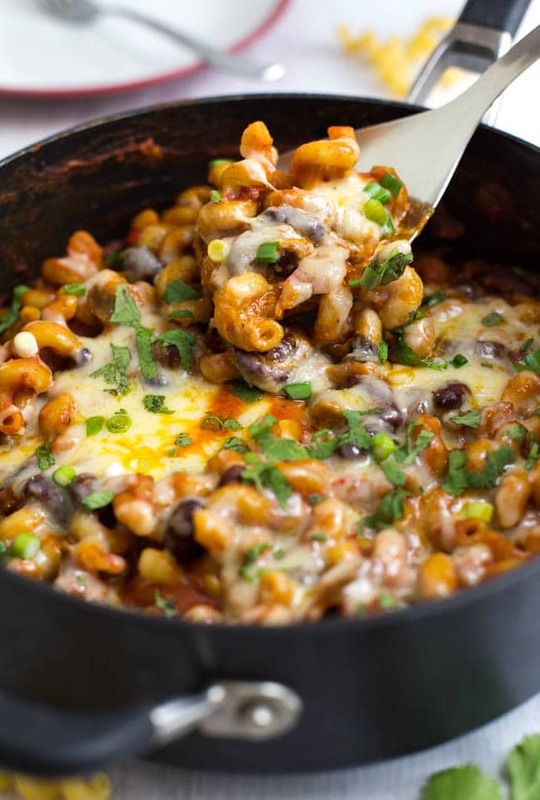 This is of my favorite one pot vegetarian recipes it’s a staple in my house during the winter! I’ve made this five or six times in under two months. 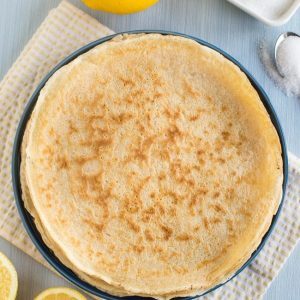 It’s so good, and so easy! I love the flexibility of it while still keeping the integrity of the original. Made a double batch tonight for extra leftovers, we can’t get enough of it! Are you using condensed tomato soup? Flavored tomato soup? Typically here in the U.S., recipes call for Campbell’s which is 1.5 cups and rather mild tasting. I’m wondering about using something else like tomato sauce (ours is much more tomatoey than the soup so maybe an 8 oz. can with one cup of water to equal the 2 cups of soup? I have to be careful about soy so can’t have most premade soups. 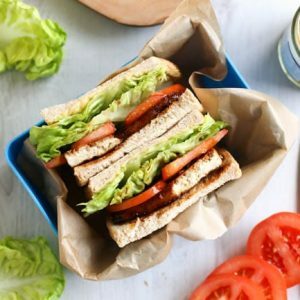 I’m wondering about veganizing this too, leaving out the cheese so my son will try it. I don’t think I’ve ever had Campbell’s (not sure we get it here?) but from Googling it looks similar – just a smooth, slightly creamy tomato soup. You could use tomato sauce instead, definitely! 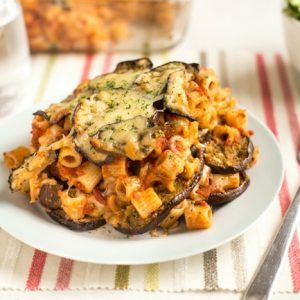 To be honest I think anything similar would work in this – just keep an eye on the quantities, you can always add a dash more water as it’s cooking if it looks like the pasta needs it :) Enjoy! I made this last night and fell in love! So so tasty and easy. Will definitely be making this again!! and using the pasta cooking technique, much easier and tastier. Will def be trying out some more of your recipes. Thanks. Yay! Thanks Alice :) This is one of my favourites too. Hope you enjoy anything else you try! Now this is my kind of comfort food. 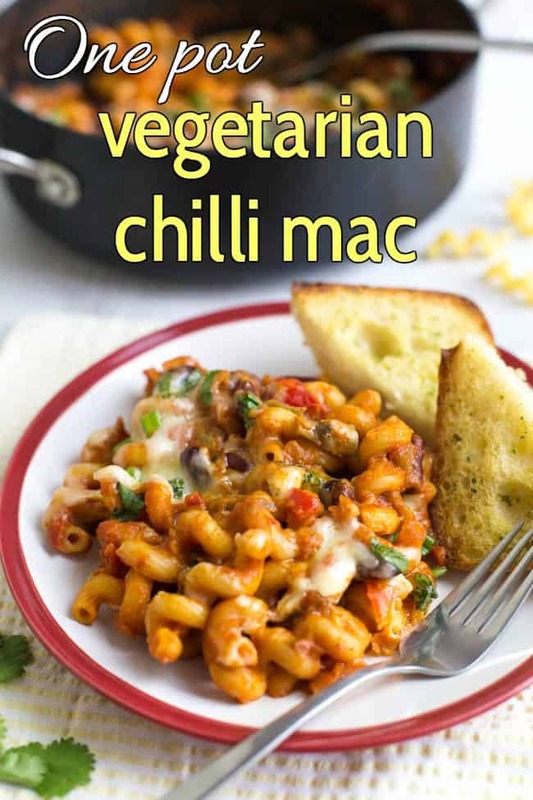 I never thought to put chilli in with mac and cheese, but now I am wondering why not – it looks amazing. I made this for dinner today. This looks SO GOOD! Love how quick and convenient it is. Will put it on the menu for Meatless Mondays! This looks so good. Love your explanation of chilli mac. two of my favorite foods combined together? THANK YOU!!!! p.s. I love the colors! 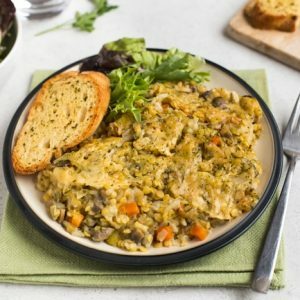 I just love the convenience of one pot meals and this one looks super inviting. Thanks for sharing!! This looks good. 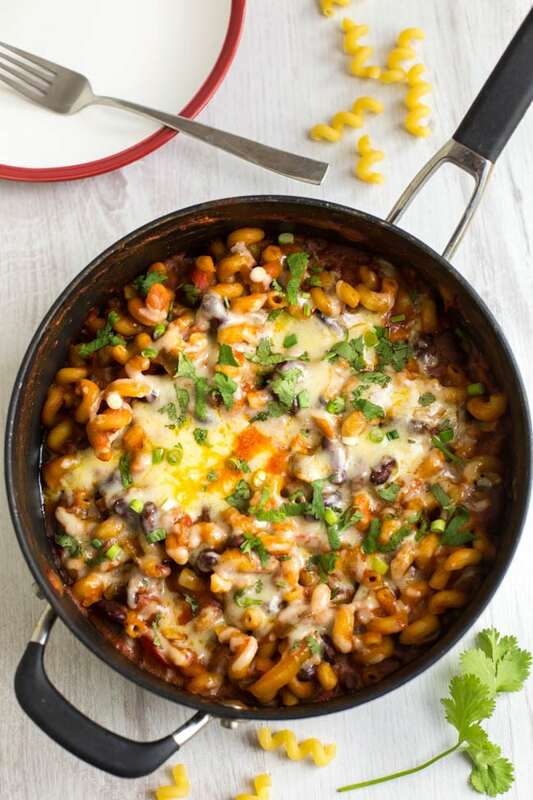 I love anything one pot and I’m always on the hunt for great meatless meal options. Love this idea and what could be more tasty and comforting than this. Cooking pasta like this is such a time saver, I’ll be doing this for sure! I hadn’t come across this idea of cooking the pasta in with the sauce until a couple of days ago and now I’m seeing it everywhere! 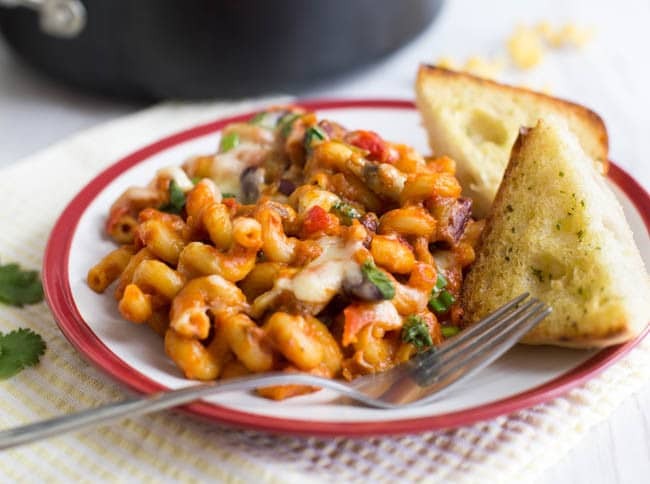 Love the idea of chilli-mac and I’m always on the look-out for good mid-week pasta meals so I’ll be giving this one a go. The thing with frozen vegetables is that they are very convenient but often more expensive than fresh – I do use frozen peas, broad beans and sweetcorn all the time, but that’s about it. And frozen carrots are just WRONG. The thing about cooking pasta in things is that the longer you leave it, the thicker it becomes, like if you make a soup with pasta in it and have some left, it can end up being stew-like in consistency (and none the worse for that). I must try your chilli mac – it looks really good. I’d probably add a leek and maybe a courgette or two, because I tend to use a lot of courgettes and leeks when cooking…. and maybe half an aubergine. And yes, definitely mushrooms. I actually don’t find them expensive! You can get a huge bag of frozen peas or corn for about a pound! This really looks very tasty and hearty. I always keep my freezer stocked with frozen veggies they are god send when you need to cook in a hurry after work. Mac n cheese is one of my favourite dishes so I’m sure I’d love this variation! I will be interested to see how the added chilli makes this taste..
Yummy! This looks incredibly delicious, I love the look of both versions but think I would prefer the chilli one. Really hope your clan enjoys it, happy Easter! I have fallen in love with this dish too, its creamy, spicy and is vegetarian I mean it is literally the perfect dish for me! Wow, two of my favourite things! My sister is a veggie and she would LOVE this too! Oh wow this looks incredible! Might have to make this! This would be an awesome vegetarian dinner for us. 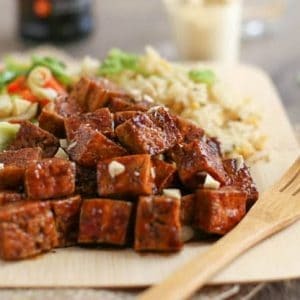 I’m always happy with a good one pot recipe and this has plenty of protein for the guys. I have never had this before, just the two (macaroni and chili) seperately but I am going to try it! I agree with you about chopping up the veggies. It is the absolute worst part of cooking especially as I am a lazy cook! I sometimes buy the pre cut at my local store even though they are more expensive just for the convenience. Lately, when I do chop up onions, green peppers etc, and have extra which I enevitably do, I freeze them. It has been working out really well when I can just pull them out of the freezer! What a great and quick dish for weeknight dinners. Excellent! My word this looks brilliant Becca! My family would love this as long as I scaled back on the spice. I love how the starch from cooking the pasta in the same pot thickens the sauce – such a great idea which I’m totally going to try! 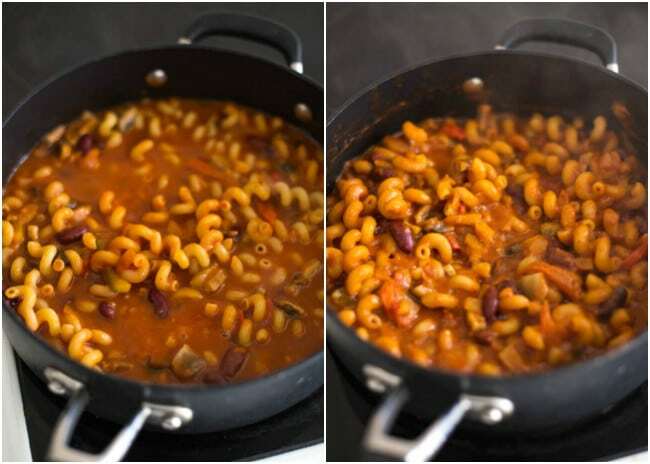 It works so well, I’ve tried this ‘one pot pasta’ method a few times now and I love it! This looks great. Frozen veg can help speed up making dinners which is handy.